At UpCity, we've built our Top Local Agency Marketplace around the goal of connecting small business owners with the best agencies in their area. While our ranking methodology is quite complex, a large portion of our algorithm takes into account the number and quality of reviews that are left on an agency's profile. Luckily, we've made it quick and easy to view your listing's reviews and respond. 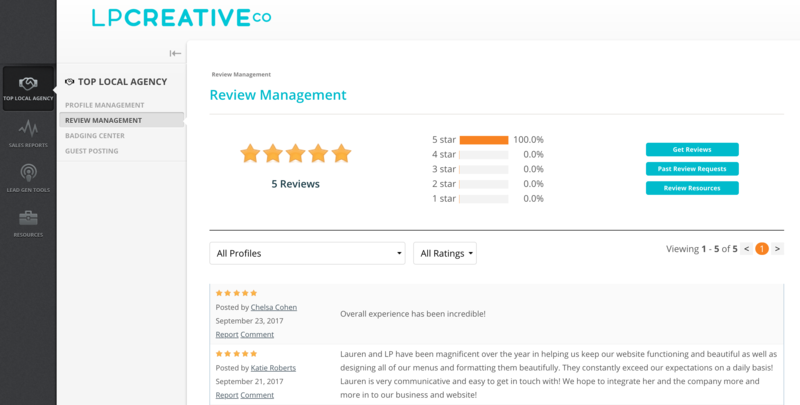 Upon visiting the Review Management area, you'll be presented with a list of the reviews that your agency has garnered across all of your profiles. If you'd like to see reviews for a specific location, you may do so by changing the drop down. Each review contains a star rating, review text, author name, and date. Once a review comes in, we recommend replying as soon as possible by using our Comment feature. Simply click the Comment button and you'll be greeted with a pop-up to respond. If you have received a review that you believe violates our content guidelines or is suspicious in some form, please use the Report option and our editorial team will follow up.